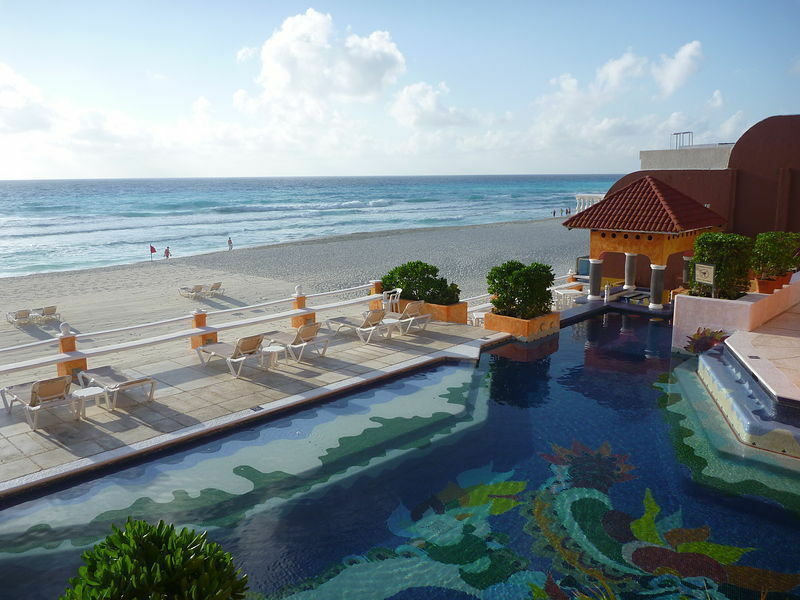 The Mia Cancun feels like your wealthy aunt's hacienda on the beach. Everybody loves a good deal, and that’s exactly what you’ll find at Cancun’s Mia Hotels, both formerly the Avalon brand, with a boutique hotel on the Cancun peninsula and the more remote resort on Isla Mujeres. Families tend to gravitate to the all-inclusive Mia Reef Isla Mujeres because of its relaxing beach and easy pricing, so let’s take a look first at what it offers. Families looking for an island setting and those who want to spend quality beach time with baby will love the Mia Reef Club located beachfront on Isla Mujeres. Six and a half miles off the coast of Cancun and accessible only by ferry, guests can use the all-inclusive resort’s round trip airport transportation for a super convenient getaway. The Mia Reef Club’s 125 rooms are perfect for families, as they have a casual beachfront feel with all the amenities and space of a country home. Especially suited to larger families are the two-bedroom villas that also include a kitchen, living room (complete with a sofa bed) and dining room. With two restaurants, families can easily relax over dinner after a day of fun and there’s even room service available after 11pm. Activities at the Avalon Reef Club include yoga, snorkeling, scuba diving (off site), kayaking, karaoke, bicycling and fishing from the resort’s private pier. The beach here is perfect for babies and younger swimmers because of its gradual slope and gentle surf. The Mia Reef Club also offers access to the on-site Kids Club, open daily from 10am to 5pm for ages 4-11. This comes in handy when your brood tires of the quiet beach scene on the island and wants some play time. Of course, you can ferry into Cancun for some shopping, a disco, the crafts museum, or a visit to the aquarium. More sophisticated, the former Avalon Baccara — long a hidden gem for those seeking an authentic, boutique experience — has become the Mia Cancun. Called “worn” and “charming” depending on your taste, it is comprised of only 27 guest rooms and suites, like your wealthy Mexican aunt’s boutique guesthouse. They’re very spacious and have full kitchens so you can really stay for a week in comfort. Overall, this Mia is small and intimate, with a cozy lobby bar and the very good Las Marias restaurant — serving indoors or ocean view — making it a good choice for families traveling with teens (who can feel independent there). The Mia Cancun, which has some suites with their own balcony Jacuzzis, is also a good option for couples with babies; the staff can arrange childcare at night, and parents can sample the city’s famous nightlife. Unlike the Mia Reef Club, this beachfront hotel has no children’s program and is not all inclusive.